Did you know 93% of people over the age of 65 have tooth decay? As you grow older, your teeth have different needs, just like the rest of your body. But the good news is, if you practice good oral hygiene and get regular dental care throughout the years, you can retain your natural teeth your whole life long. 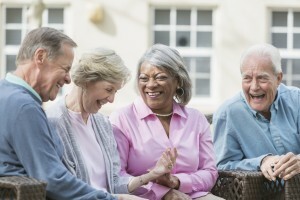 In this post, find out how your smile is impacted by the aging process and what you can do about it from the team at West 7th Smiles, your premier dentist in Fort Worth. What Are The Effects Of Aging On Oral Health? Attrition – Through regular wear and tear (known as attrition), teeth can become shorter, worn-out, and can be more susceptible to breaking, and developing chips, cracks, and infections. Tooth Decay – This common condition causes cavities, infections, and can lead to the need for root canal therapy. Tooth decay can even damage your teeth so greatly that they have to be removed. Dry Mouth – Growing older can mean a decrease in saliva production for majority of people. Since this natural lubricant’s job is to remineralize teeth and to protect them from tooth decay, dry mouth can contribute to cavities and oral thrush (a painful fungal infection in the mouth). Periodontitis – Gum disease is remarkably common, especially as you age. As time passes, many seniors have gingivitis that progresses into periodontitis (advanced gum disease), which can cause you to lose your teeth. How Does My Aging Smile Impact My Overall Health? Since everything in the body is connected, your oral health affects your overall health as you get older. And, the opposite is also true: how you take care of your physical health directly impacts your teeth. Healthy Smile, Healthy Heart – The link between good oral health and decreased heart disease is well-known. Chronic inflammation from gum disease is connected to the development of heart disease, atherosclerosis, high blood pressure, and stroke – the risks of which increase with age. Taking care of your smile as you age is good for your heart, and your entire body. Healthy Body, Healthy Smile –Getting older means an increased likelihood of systemic diseases that impact your smile like diabetes and even oral cancer, which can make you lose teeth and permanently damage your grin. And, don’t forget that medications can affect your teeth, too, so talk with Dr. Boyd about oral and physical health strategies if you have a chronic, age-related health condition. What Can I Do To Take Care Of My Teeth As I Age? 2×2 – Brush your teeth gently for two minutes, twice a day – and floss while you’re at it. If arthritis or joint problems make it hard to hold your toothbrush, consider switching to an electric one, since these are easier on hands. Stop Smoking – If you’re still using tobacco products in any form, stop now. Not only will you protect your heart and lungs, you’ll drastically reduce your risk for oral cancers. Eat Healthy – Limit sugar in both foods and beverages since it causes tooth decay and can lead to diabetes. Load up on dairy products and leafy greens to get the calcium you need to keep your bones and teeth strong. Drink More Water – To increase oral hydration and prevent dry mouth, drink enough water each day. See Your Fort Worth Dentist – No matter what age you are, you should see your dentist for regular preventive care at least twice a year. Dr. Boyd can help you stay ahead of oral cancer, systemic diseases, and tooth loss. And, if you’re missing teeth, he can help you avoid dentures with dental implants. Now that you know how your smile changes as you age, and what you can do about it, schedule your appointment with West 7th Smiles today to keep your teeth healthy in your golden years!